AUBURN HILLS, Michigan, Jan. 22, 2019 -- TI Automotive, a leading global supplier of automotive fluid systems technology, announced today that it will provide blow‑molded plastic fuel tanks for Karma Automotive's luxury electric vehicle program. TI Automotive's industry leading technology allows the low weight plastic tanks to handle the high vapor pressures that are created in extended range electric vehicles (EREVs) like those being produced by Karma in Southern California. next fall, the tank will be part of a new Karma luxury electric vehicle, representing the global introduction of TI Automotive's unique double molded tank for HEV applications. This innovative plastic tank, already being used by pre-production validation vehicles, not only weighs significantly less than traditional steel tanks but also tolerates fuel vapor pressurization up to 500 mbar. This allows optimization of the vehicle's full electric operating range driving mode. 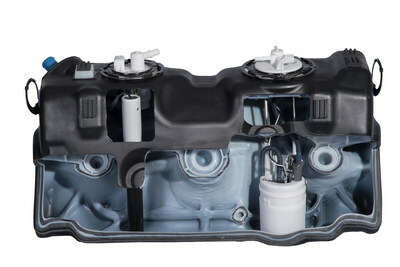 TI Automotive manufactures this tank using its patented and 2014 PACE innovation awarded Tank Advance Process Technology (TAPT) manufacturing process.